Most recipe scaling is pretty obvious. Use scale factors to adjust the ingredient amounts. For example, if you are tripling the recipe, use three times as much of each ingredient. Or to halve the recipe, use half as much of each ingredient. But one aspect of making a very large recipe is often overlooked by people without culinary experience. For large recipes the amount of produce needed to purchase is greater than the amount mentioned in the recipe. Sometimes a surprising amount of the vegetable is trimmed away and never makes it into the pot! On normal days, most people cooking at home ignore this. They begin their meal planning by considering what is in the refrigerator rather than making a shopping list. However, if you were planning a big recipe (perhaps something for a Thanksgiving dinner for 20 people, or for a thank-you meal at a non-profit for 50 people) then you would shop specifically for that meal and it would be a problem to discover that you purchased too few vegetables! Kitchen math often uses a mix of pounds and ounces instead of a decimal number of pounds. There are 16 ounces in 1 pound. We can convert from a decimal to pounds and ounces by peeling off the less-than-one part of our decimal answer and multiply that by 16. For example, if a weight was 9.4 pounds we would do 0.4 pounds × 16 ounces per pound ≈ 6 ounces for a converted value of 9 pounds 6 ounces. We can convert from pounds and ounces to a decimal by dividing the ounces by 16 and appending that to the whole number of pounds. For example, if a weight was 9 pounds 6 ounces we would do 6 ounces ÷ 16 ounces per pound = 0.375 pounds for a converted value of 9.375 pounds. 1. Work with your group. Weigh your vegetable on the kitchen scale. Then trim it appropriately, and weigh it again. Write both weights as a decimal number of pounds. 2. Write both weights as pounds and ounces. 3. Use a proportion. If you had shopped for 10 pounds of your vegetable, how many pounds would remain after trimming? Write your answer as a decimal number of pounds. 4. Express your previous problem's answer as pounds and ounces. 5. Use a proportion. If you needed 10 pounds of trimmed vegetable, how many pounds would you need to shop for? Write your answer as a decimal number of pounds. 6. Express your previous problem's answer as pounds and ounces. 7. 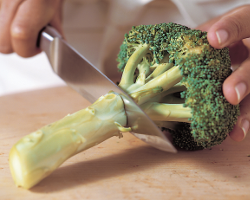 Express the amount of trimmed vegetable as a percentage of the original purchased amount. There is an official name for the percentage you just found. The Yield Percent scales down from the purchased amount of produce to the trimmed and usable amount of produce. For example, if you buy 10 pounds of potatoes, after you trim and peel them there is only (on average) 7.8 pounds of usable potato for a recipe that requires peeled potato. As another example, 10 pounds of cherries, after pitting, results in about 8.2 pounds of usable cherries. The table to the right lists the yield percent for a few common types of produce. This will be the official table we use in class, so that our answers agree when solving problems. Other tables of Yield Percents are available online (two examples). Note that these values are estimates. There are small variances because no two chefs or cauliflowers behave identically. There are also Yield Percents for meats. But these have even more variation, because ways to trim meat also depend on how the meat will be cooked. As one example, see pages 27-45 of the USDA 2012 guidelines. When using yield percent values, remember to continue our habit of changing each percent into decimal format before doing other arithmetic with it. Notice that yield percent is a scale factor that scales down from the amount actually purchased. It answers the question, "How much of this produce item makes it into the meal?" To answer that question we would use the scae factor normally and multiply. 8. A restaurant buys 100 pounds of potatoes. How many pounds of trimmed potatoes will this make? 8. The yield percent for potatoes is 78%. Use the decimal 0.78. But much more common in real life is to instead answer the question, "If we want a certain amount of this produce item in the recipe, how much do we actually shop for?" Then we must work backwards (scale up instead of scale down) and divide by the yield percent. 9. A restaurant needs 100 pounds of trimmed potatoes. How many pounds of potatoes should they buy? 9. The yield percent for potatoes is 78%. Use the decimal 0.78. 10. A recipe that makes 28 servings requires 5 pounds of carrots. How many pounds of carrots should you purchase if you are scaling up the recipe to make 105 servings? If carrots cost $0.75 per pound, what will that ingedient cost? 10. First we find how much we are scaling up the recipe. Then we scale up the ingredient amounts. But we are not done yet. The yield percent for carrots is 81%. Use the decimal 0.81. For the sake of clarity, this website abbrevates teaspoons as tsp, and tablespoons as Tbsp. Scaling down from cups to measuring spoons is straightforward if we know the conversion rates. 11. A restaurant recipe that makes 30 servings requires 2 cups of butter. You want to scale the recipe down to make 6 servings. How many tablespoons of butter will it have? 11. The recipe will be scaled down by a factor of 30 ÷ 6 = 5. So the scaled down recipe will have 32 ÷ 5 ≈ 6 Tbsp of butter. However, scaling up can present an added challenge. What do we do with the decimal amount of an answer? Imagine we scaled up a recipe and found it required 3.2 cups of olive oil. How would that number be used in real ife? In most restaurants, large recipes use weights instead of volume. The most realistic answer is to use a conversion rate to get pounds or kilograms of oil, and then use an electric scale. 12. One gallon of olive oil weighs 7.6 pounds. What is the weight of 3.2 cups of olive oil? 12. Replace 1 gallon with 16 cups. Then use a proportion. If 16 cups weigh 7.6 pounds, how much will 3.2 cups weigh? 3.2 × 7.6 ÷ 16 ≈ 1.5 pounds. Sometimes the best answer is rounded cups. We could round 3.2 cups either down to 3 cups or up to 3 1⁄3 cups, using our intuition for whether a bit less or more oil would best help the recipe. The most rare case—but the most interesting for a math class—is when we want to change the decimal amount back into the smaller measurement unit. 13. Express 3.2 cups as 3 cups and some tablespoons. 13. There are 16 tablespoons in a cup. So we multiply the 0.2 by 16. 0.2 × 16 ≈ 3 Tbsp. We still have the 3 cups too! Our final answer is 3 cups and 3 Tbsp. The same technique works if we had a decimal amount of tablespoons, but wanted tablespoons and teaspoons. 14. After scaling up a recipe you get 11 teaspoons of cinnamon. Express this amount in tablespoons and teaspoons. 14. First we divide to switch to tablespoons. 11 tsp ÷ 3 tsp per Tbsp = 3.67 Tbsp. Then we multiply the 0.67 by 3 to go backwards and change it back to teaspoons. 0.67 Tbsp × 3 tsp per Tbsp = 2 tsp. We still have the 3 Tbsp too! Our final answer is 3 Tbsp and 2 tsp. 15 and 16. Lots of numbers! Answers are on a Google spreadsheet. You can also save your own copy of that spreadsheet and try fiddling with the prices or other values to instantly see how the total food cost changes. 17. One gallon of whole milk weighs 8.6 pounds. What is the weight of 6.5 cups of whole milk? 17. Replace 1 gallon with 16 cups. Then use a proportion. If 16 cups weigh 8.6 pounds, how much will 6.5 cups weigh? 6.5 × 8.6 ÷ 16 ≈ 3.5 pounds. 18. Express 2.8 cups as 2 cups and some tablespoons. 18. There are 16 tablespoons in a cup. So we multiply the 0.8 by 16. 0.8 × 16 ≈ 13 Tbsp. We still have the 2 cups too! Our final answer is 2 cups and 13 Tbsp. 19. After scaling up a recipe you get 19 teaspoons of cinnamon. Express this amount in tablespoons and teaspoons. 19. First we divide to switch to tablespoons. 19 tsp ÷ 3 tsp per Tbsp = 6.33 Tbsp. Then we multiply the 0.33 by 3 to go backwards and change it back to teaspoons. 0.33 Tbsp × 3 tsp per Tbsp = 1 tsp. We still have the 6 Tbsp too! Our final answer is 6 Tbsp and 1 tsp. Here are Math 20 review problems about unit rates and proportions. Each time you load the page these problems change! 26. You purchase 20 pounds of celery. How much trimmed celery can you expect this to make? 27. A recipe that makes 8 servings requires 1.5 pounds of celery. How many pounds of celery should you purchase if you are scaling up the recipe to make 30 servings? 28. One cup of uncooked long-grain brown rice weighs 7.2 ounces. What is the weight of one gallon of uncooked long-grain rice? 29. Express 6.3 cups as 6 cups and some tablespoons. 30. After scaling up a recipe you get 19.1 teaspoons of cinnamon. Express this amount in tablespoons and teaspoons. 31. You work for Quinn's Quality Spices, and are asked to place the next order. The store buys from a wholesale supplier that charges 70% of your retail selling price. The order is listed in a table below. What is the total wholesale cost of the order? Once the entire order sells, what is total retail cost and profit? 32. An elementary school fundraiser includes serving ice cream. The school has a very good idea how much ice cream is needed because it has hosted this event for many years There will be 300 guests attending. 60% of the guests will want a half-cup serving, and the remaining 40% will want one cup of ice cream. As for flavors, 50% of the servings will be vanilla, 30% will be chocolate, and 20% will be strawberry. How many gallons of each flavor ice cream will need to be bought?